For John and Pam Finley, African art, specifically from West Africa, captured their imagination because of the objects’ cultural significance and aesthetic beauty. For example, many were created to teach morals or provide protection and safety. The Finley’s collection includes ceremonial figures, weapons, drums, and masks, made from a variety of mediums such as wood, shell, and ivory. Recognizing the influence that African art has on folk art, the Finleys began adding contemporary folk art from New Orleans, Mrs. Finley’s hometown. 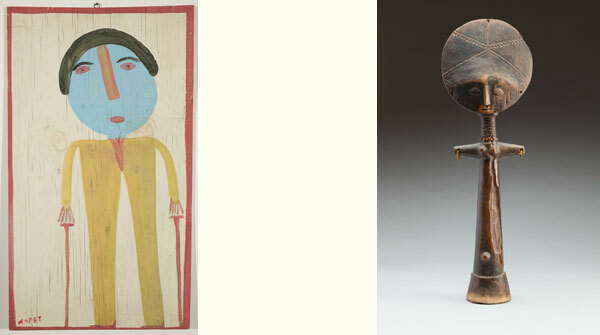 Together, the African objects and the folk art reflect and showcase the Finley’s collecting perspective. The Finley’s placed their collection of almost 200 objects on long-term loan with the University of Wyoming Art Museum in 2011. The Art Museum has existing collections of ethnographic and folk art objects, including Papua New Guinea, Native American, and Rapa Nui objects. The John and Pam Finley Collection of African and Folk Art is the first exhibition at the University of Wyoming drawn from their collection and will feature both West African and folk art objects, presented together in the spirit of the way they were collected.